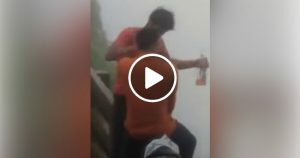 A terrible video, which went viral on Thursday, shows two men in allegedly under the influence of alcohol falling to their death at Amboli Ghat in Sindhudurg, Maharashtra. Two revelers died after falling into a 2,000 feet deep valley on August 1. Their dead bodies are yet to be recovered. Kawale Saad Point is the place where the incident took place, a popular picnic point. The victims and their friends work at a poultry farm in Kolhapur. It is said that all other friends left the Kawale Saad Point after spending some time, but Garadi and Rathod stayed back. Soon their friends approached Sawantwadi Police and informed about the two missing. Police found out about the mishap from local people and shopkeepers and roped in trekkers of Hill Riders Group to search for the duo. The bodies were spotted down in the valley, but were yet to be recovered as heavy rain, water cascading down the hill and mist made the operation difficult, the officer said. “Imran Garadi (26) and Pratap Rathod (21), who were part of a group of seven, fell into the valley. Their bodies are yet to be recovered,” said Sunil Dhanawade, Senior Police Inspector of Sawantwadi police station. 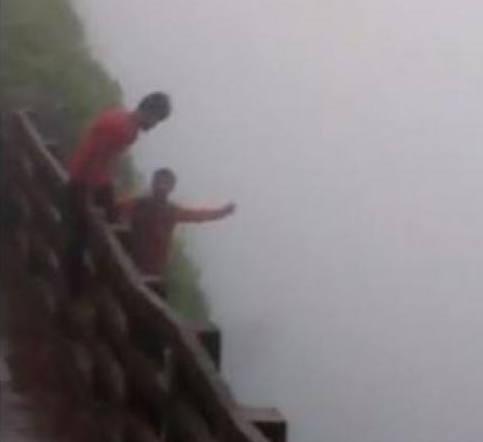 In the video, we can see the two boys having bottles in their hands, climbing the fence around the edge of the valley and backtracking once or twice. As they stood on the edge, they slipped from the fence and fell down into the valley. So, guys careful at such places that are too dangerous and don’t drink alcohol as they can kill us without knowing.